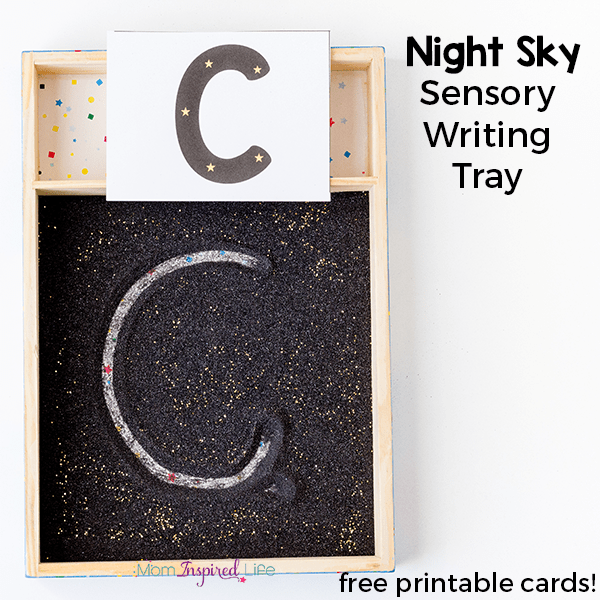 My kids loved this night sky writing tray! 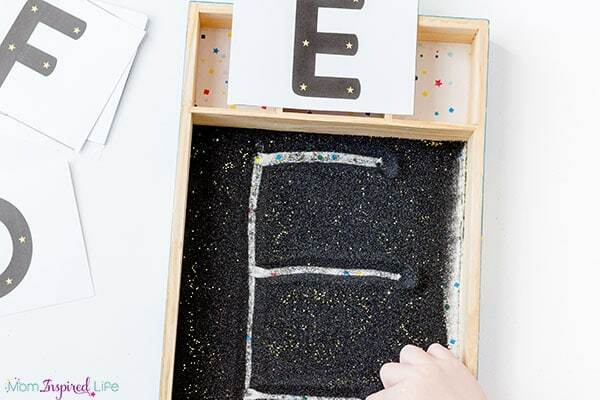 It’s a great writing or pre-writing activity to add to your space, stars or nighttime theme lesson plans! 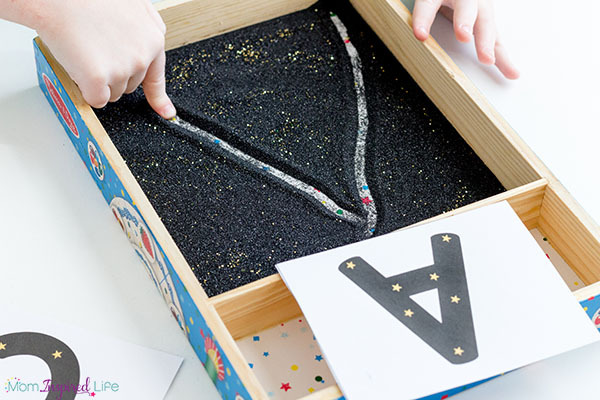 It’s so easy to set up and the free printable constellation cards make it even easier! My kids always enjoy a good writing tray. 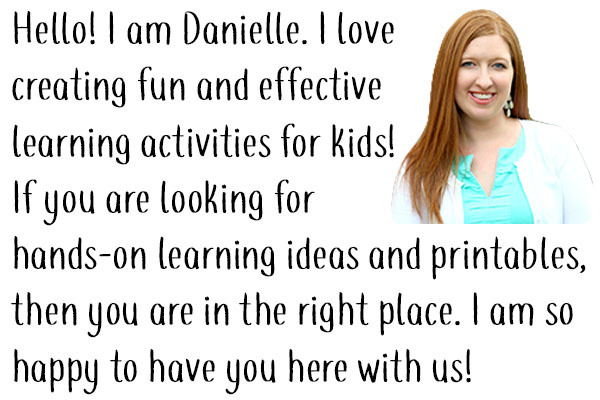 They love running their fingers through them, doodling, drawing pictures and even practicing writing letters. 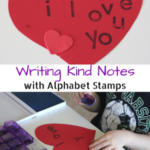 They are engaging way for kids to develop handwriting and fine motor skills. 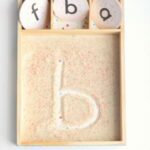 One of our absolute favorites is the sugar cookie sensory writing tray. It smells fabulous and also comes with free letter cards. 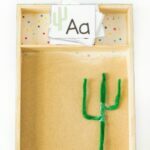 We also had fun with this desert writing tray. I can’t wait to make even more! 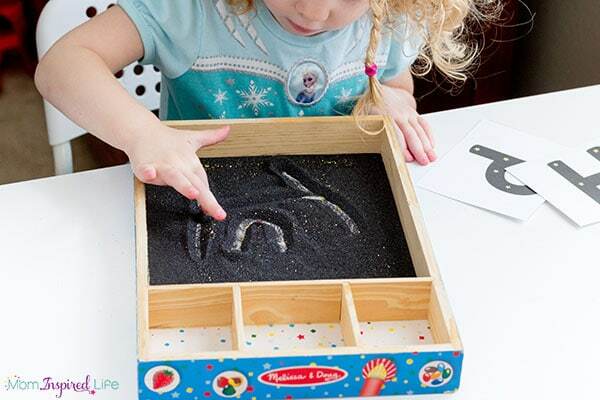 For this night sky writing tray, you only need two supplies and they are super affordable. 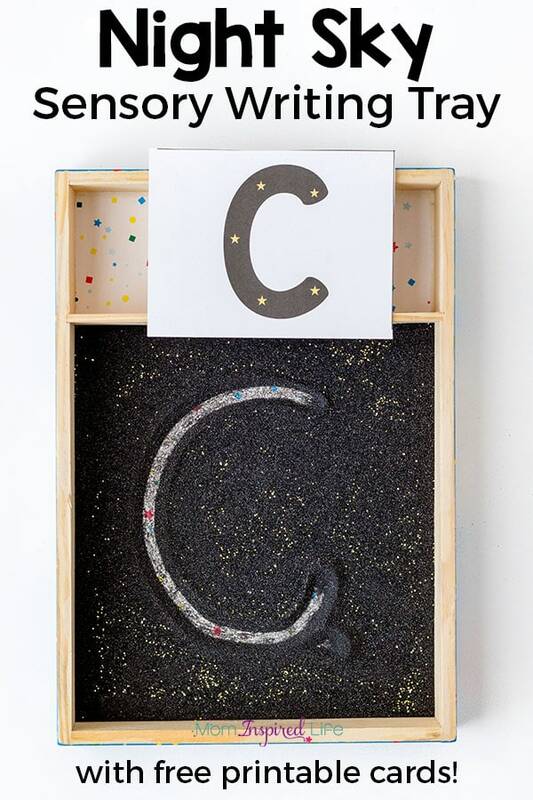 I already took care of the night sky constellation alphabet cards for you! 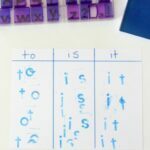 Print out the night sky alphabet cards and cut them apart. Pour a small amount of black sand in the tray. You want enough to cover the bottom of the tray, but not so much that it is hard to form the letters in it. 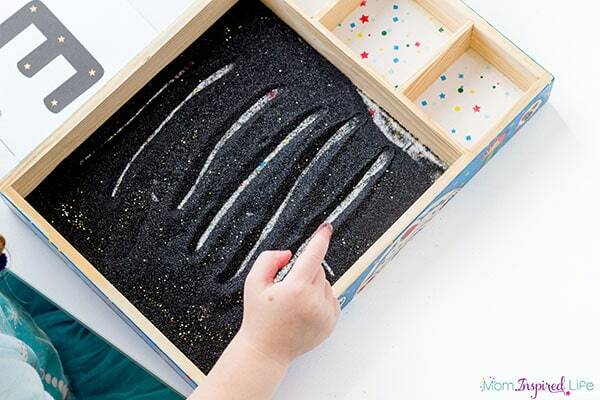 Add a small amount of glitter to the tray and mix it up with your finger. As soon as I brought the tray out for my kids they came running over. I told you they love writing trays! I told them it was a night sky writing tray and they were even more excited. My son thought it was super cool. I will say they quickly got in a bit of disagreement about who could play in it first, but we eventually decided that my three-year old daughter would get her chance first. If you have a class full of kids, you may want to make more than one of these or use a bigger tray at least. My daughter loved making all kinds of lines and swirls and shapes in the writing tray. My 5-year-old son practiced writing letters. 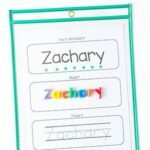 It is especially helpful with letters he has difficulty forming. He does not enjoy writing the letters over and over again on paper, but really does like to write them in the tray. I quickly realized that I should have included some number cards as well because my son needs practice with that. So I made some and have included them in the file for you too. I still have this one put together and we’re continuing to use it all month long. I can’t wait to share my next writing tray with you! Stay tuned. 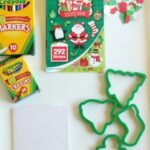 Here are some more activities I think you will enjoy!